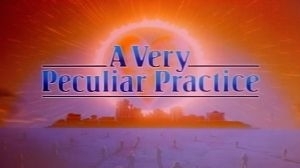 A Very Peculiar Practice was a British comedy show from the mid-1980s -very dark in it's humor, with extreme characterization and bizarre situations, set around a University Medical Practice. The main characters were Dr Steven Daker (the new, young, impressionable one), Dr Jock McCannon (the old, alcoholic, world-weary one), Dr Bob Buzzard (the bitter, egotistical, abrasive one) and Dr Rose Marie (the feminist, bisexual, politically motivated one). Add to these a smattering of students, lecturers, the regular love interests for Dr Daker (Lyn in Series 1, and Greta in Series 2) and the strangely compelling nuns that roamed the campus causing mayhem. Then throw in plots that cause emotional, physical, or mental reactions, and sit back to watch. Dr Stephen Daker returns to his position as chief of the Lowlands University medical practice to find an American installed as vice chancellor and to face charges of unprofessional conduct from a volatile Polish professor. The head of the art history department tries to save his job with an endowment of fake paintings while Steven struggles with the contradictory behavior of Grete. July 17th 2011 Description edited by Administrator.